Stuffed Mini Sweet Peppers with Cheese and Bacon is an easy, versatile appetizer recipe that you can whip up in just about 15 minutes. Let’s be honest: I think we all like our food to impress at parties. When it doesn’t, it’s a bit of a letdown. We may not admit it, but we all secretly want to set down a tray, bowl, or plate of something and come back five minutes later to find it down to the last crumb. And then we get to smile and chime in with, “Oh, I did!” while pretending like we didn’t have high expectations for its consumption. The next step is more praise, invariably followed by at least a few requests for the recipe. If you secretly (or maybe not-so-secretly) walk into every gathering with those kinds of expectations, then you’ll love this Stuffed Mini Sweet Peppers with Cheese and Bacon recipe. It’s so good that it’s sure to produce a moment like that wherever you go. The best part is it doesn’t require a day in the kitchen or even an hour. Not even a half-hour! You can put together Stuffed Mini Sweet Peppers with Cheese and Bacon in just about 15 minutes. They’re a great last-minute appetizer when you’ve spent the day working or running around trying to check everything off your to-do list. This is hands-down one of the best mini sweet peppers recipes you’ll ever try, so let’s get started! 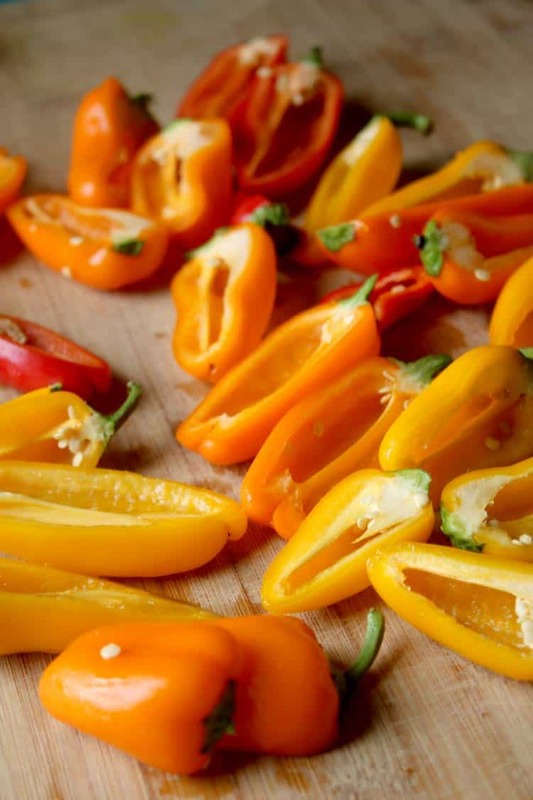 First, you’ll need to prep your mini sweet peppers by washing, drying, and deseeding them. Next, combine goat cheese and ricotta cheese with the thyme leaves and bacon. You can also substitute the ricotta cheese for cream cheese. Sprinkle this mixture with salt and pepper to taste. Time to stuff the peppers. Fill each pepper half (don’t be shy; load it up!) and then sprinkle Parmesan cheese on top so your peppers. The peppers should have begun to blister a bit and the cheese should have begun to brown. Remove them from the oven and serve them immediately on a serving tray. 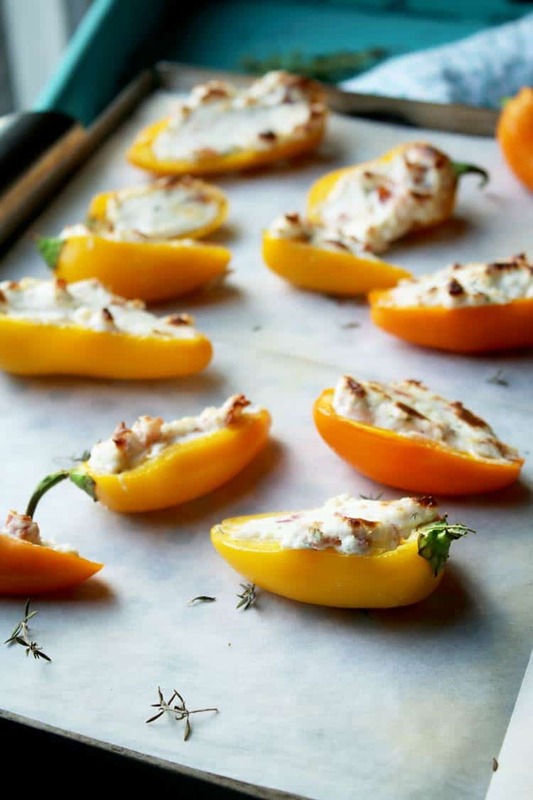 Want More Stuffed Mini Sweet Pepper Recipes? If you’d like more stuffed mini sweet pepper recipes, please let me know! 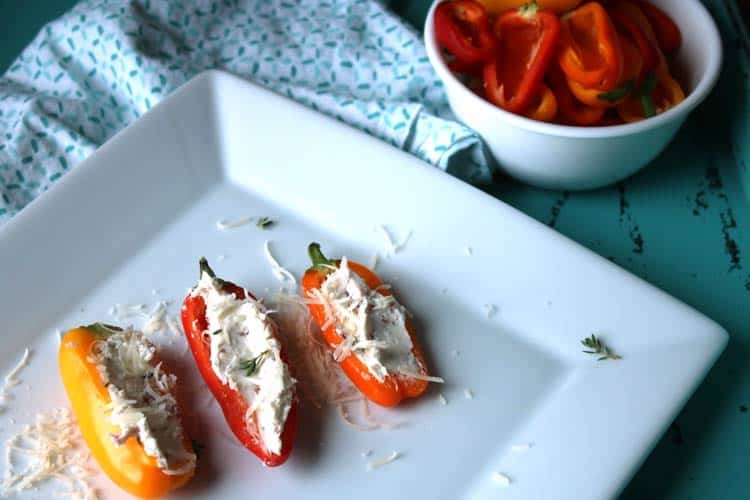 If you’d like a stuffed mini pepper recipe that is definitely not sweet, check out Stuffed Jalapeno Poppers with Cool Dip. This recipe is the perfect party appetizer! 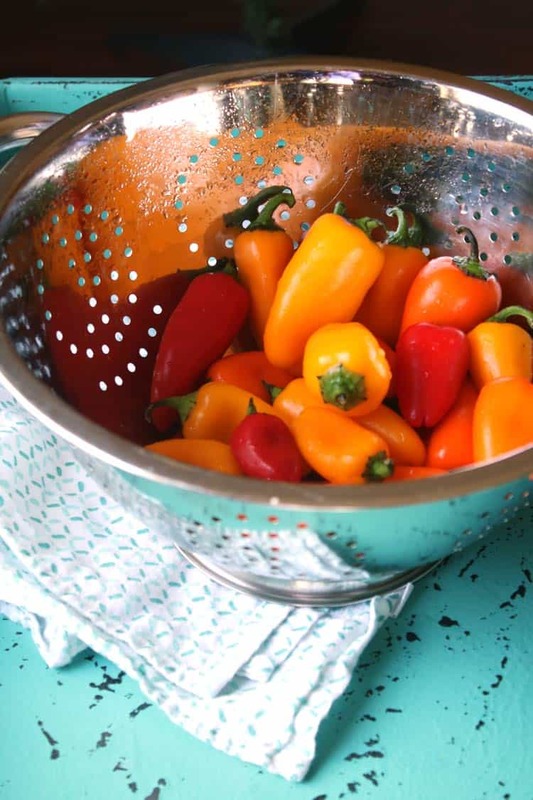 Wash mini sweet peppers and pat them dry. Leaving the stem intact, cut each pepper in half lengthwise. Deseed and remove the membrane from each pepper. Discard seeds and membrane, and set peppers aside. 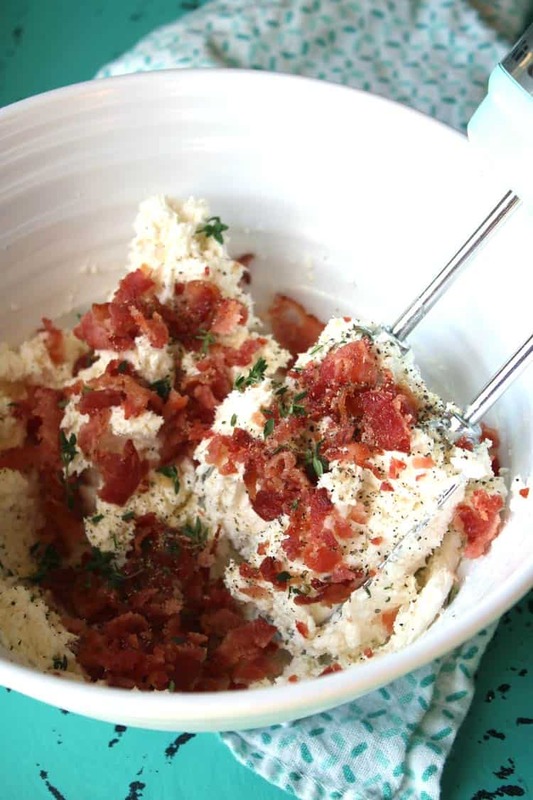 Combine goat cheese, ricotta cheese, bacon, and thyme leaves in a small bowl. Sprinkle with salt and pepper to taste. Using a small spoon, fill each halved pepper with cheese mixture and arrange on a baking sheet covered with parchment paper. Sprinkle each halved pepper with Parmesan cheese. Place tray of peppers in the oven under a preheated broiler set to "high." 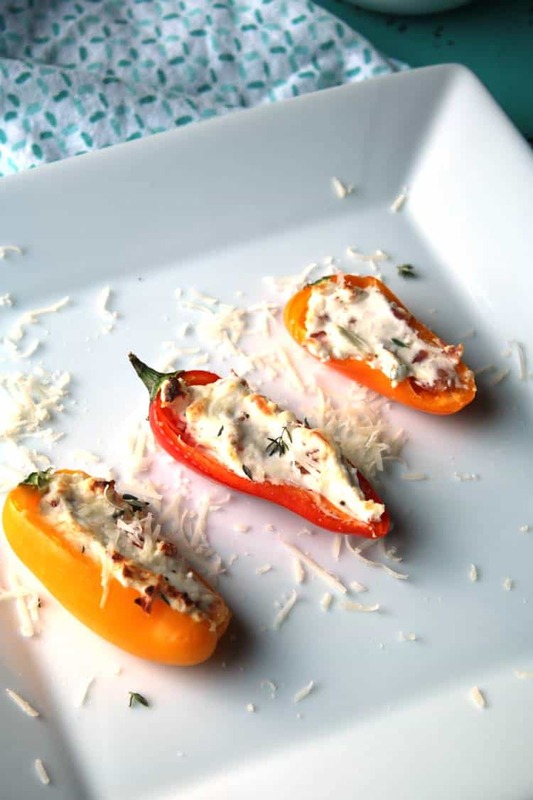 When cheese begins to brown and the peppers start to blister (approximately five minutes), remove them from the oven and serve immediately on a serving plate.